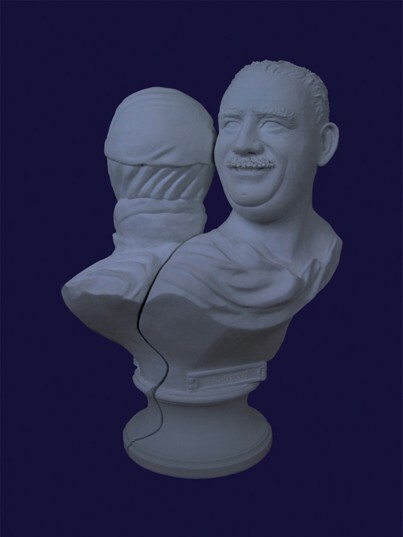 Depending on perspective, the sculpture depicts the Kurdish terrorist Abdullah Öcalan or the Kurdish politician and human rights activist Leyla Zana. The binary oppositions used for the creation of terror icons in mass media and moralistic monuments are lifted in this dyptichon. The portraits are divided/united by a crack. The sculpture is, so to speak, destroyed before its emergence, as the Kurdish in context of the “Urban Realities. Focus Istanbul” exhibition. Between both components of the sculpture is a vectorless, ideology-free, immaterial space. It is an inflection point, on which the curve changes its direction. This nothingness is variable and depends on political states. It is called Kurdistan. Once grounded, it is suggested that the portrait of Zana be placed at a leftmost geographical point, and the portrait of Öcalan on a right most one, as instructions for public display suggest.